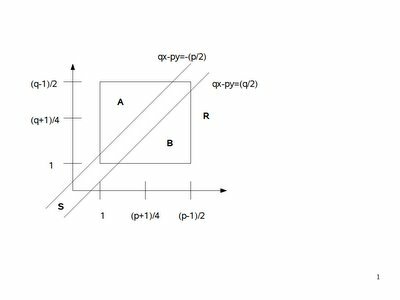 In today's blog I continue the proof for the Principle of Quadratic Reciprocity. If you are not familiar with the concepts of quadratic reciprocity, quadratic residues, or the Legendre Symbol start here. If you would like to start this proof at the beginning, start here. If you would like to start with Gauss's Lemma, start here. Today's proof is taken from Gareth A. Jones and J. Mary Jones' Elementary Number Theory. qx - py is greater than -(p/2) if and only if qx' - py' is less than q/2. if qx' - py is less than (q/2), then qx - py is greater than (-p)/2. (e) (-p/2) is less than qx - py which is less than (q/2). (f) μ = the number of elements (x,y) ∈ P x Q where (-p/2) is less than qx - py which is less than -1. (g) ν = the number of elements (y,x) ∈ Q x P where (-q/2) is less than py - qx which is less than -1. 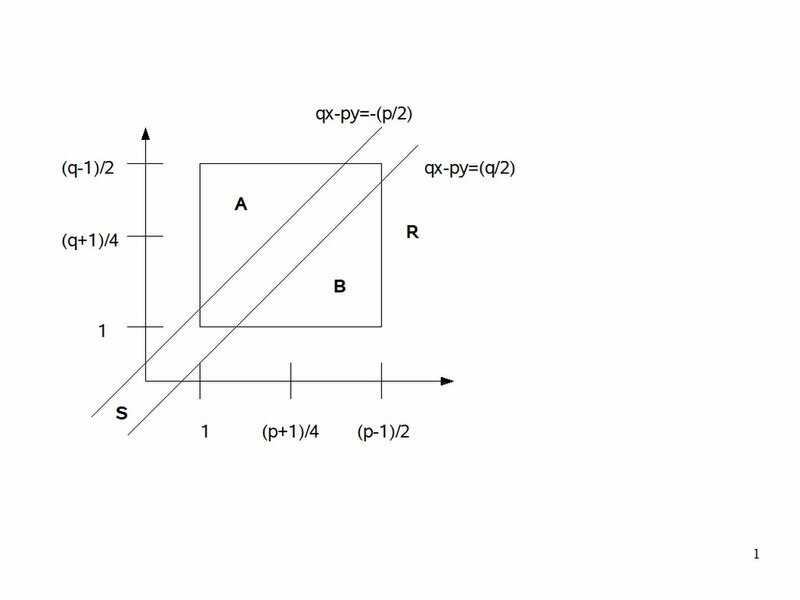 (b) So, for example, the corners of R before the rotation are: (1,[q-1]/2), ([p-1]/2,[q-1]/2), (1,1), and ([p-1]/2, 1). (c) After the rotation, the corners of R' are: ([p-1]/2,1), (1,1), ([p-1]/2,[q-1]/2), and (1,[q-1]/2). (d) So, we see that R' has the same corners as R.
(e) By Lemma 2, we see that there is a one-to-one correspondence between A and B. (5) So, this means that α + β ≡ 2*α ≡ 0 (mod 2).